Another jaunt in the gulf. Another desert. Another bout of sunny mornings. Another place so far from home, yet somehow far from unfamiliar. I took on a short-term contract in Oman and haven't regretted it. Although I hadn't intended to return to the gulf, I was once again reminded that when I attempt to plan life, life doesn't want to go according to plan. No worries! I'm getting better at going with the flow. Being in Oman has reminded me of some of my favourite things about Kuwait: the sun, the access to things like cheesy macadamia nuts (from Al Rifai) and mint lemonade. At the same time, it has a different feel to it (obviously). I wake up, go for a walk and find myself face-to-face with mountains, animals and the Omani, who are less inhibited to talk to me. The kindness of people in a foreign land is always surprising and incredible to me. The locals don't know me, but people smile, offer rides when I'm carrying my groceries home, and even attempt a quick chat when I'm out shopping. It's a quiet, peaceful existence where I've been able to stop, think, reflect and figure out how to keep moving forward. Sometimes it's so much less stressful than life at home in Canada that I feel guilty that this life is luxurious in a way that I don't feel I'm adequately describing. This nomadic life is one I never believed I could have. Admittedly, it's not permanent, but I have been on the move since I was 17 years old and moving to Japan (because my parents wanted me to spend more time with my family and learn more about the culture and language). I don't think they realized what they created: a curious monkey. I've been inquisitive enough about Oman that I've been doing my best to travel when I'm able. The Irish chef and I have gotten to enjoy a lot here! A friend of mine and I decided to abduct a mutual friend for her birthday. We headed to Nizwa's Golden Tulip Hotel for some grub, cocktails (yes, alcohol is legal in Oman!!!) and swimming. It rained a tad, but that didn't stop us from enjoying ourselves! This hotel's decor is gorgeous! I promise it's more comfortable than it looks! The view of the pool from our table outside where we had the whole place to ourselves! After leaving the hotel, we continued our day at the souq. It was quite big and had some really great knick knacks AND a post office!!! Yes, folks, Oman has a postal system that actually works!!! There were cars all over the souq-a mix of old and new. These lanterns, however, are beautiful enough to risk taking back home! LOVE!!! These hand painted dishes aren't my style, but the colours were so eye-catching! A CLEARLY LABELLED post office!!! Wadi Dham: A wadi is a riverbed/valley/ravine that fills with water during rainy season. Many people go swimming in the wadi and it's a popular place for locals to go, eat, socialize and swim. We took a day trip with friends and it was a blast! Driving around the mountain to get to the wadi. Stopping to enjoy the view and double-check the map. Just gorgeous here! It was a rocky road there, but we managed! Just needed to walk a bit to get to the water, but what a nice view. Is THAT the wadi?!? Nope. It was just a puddle with tons of tadpoles! The view from behind. Stunning! Hey-hey! Look who wanted to hang out! These guys all hung out together for quite awhile. The donkey nuzzled and played with the baby camel while we were around. So cute!!! Now it's time for the food shots!!! We live in a remote locale and so eating out isn't easy because there aren't many choices and delivery is just not always possible, so we cook and bake...A lot. 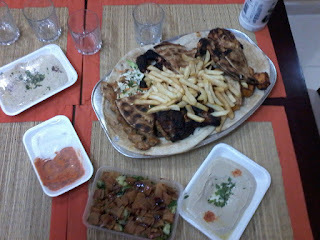 However, there have been a (precious) few occasions we've enjoyed "takeout". Wowza this was delicious!!! This was a catered event at work. The meat was so tender! I think it was goat. The Irish chef has perfected baking bread!!! It's delicious with his homemade garlic butter!!! My first attempt at using our gas oven went...Okay. The banana & date loaf wasn't burnt, thank goodness! I decided to try making ice cream from scratch. With a handheld mixer, I'm sure it's easy! With a whisk, it's suicidal. I did it with a whisk anyway (I don't have a handheld mixer). 20 minutes later, the cream was ready! LOL! The finished result: homemade salted caramel ice cream! Ice cream wasn't daunting enough, so I made homemade fruit and nut bars. I used raisins, dates, figs (all dried), coconut, flax, chia, sesame and pumpkin seeds. For nuts, I chose peanuts, almonds, cashews and walnuts. I used organic coconut palm sugar and some honey to make everything stick together. ...and VOILA! I put this in the freezer, then moved it to the fridge and it was fantastic! We're in such a transition phase I don't think you want to even hear (read) about it. The short version is that the Irish chef is leaving for a quick visit to Ireland in a week, then he's off to China (Shanghai) for an amazing job!!! This is where he and I will part ways for a bit. I'm back to Canada soon, and then...Well, I'm not 100% sure where exactly I'll be next ;) I'll keep you posted! Until then, we're just kickin' it in Oman! Hey! Wow Oman looks gorgeous. Actually, any place that has friendly people immediately looks beautiful right? Certainly a refreshing change from Kuwait! How long will you be there for? I've been here since February and my contract is almost finished, so I'll be back in Canada soon. Are you still in Kuwait? Those painted plates are gorgeous, right?? I just couldn't tear my eyes away from them! If you're in Kuwait, then Oman wouldn't be too far for a getaway ;) Those plates were at the Nizwa Souq.